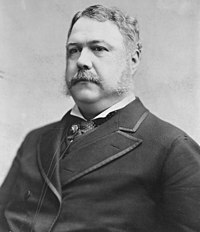 Chester Alan Arthur (October 5, 1829 – November 18, 1886) was an American politician who served as the twenty-first President of the United States. Arthur was a member of the Republican Party and worked as a lawyer before becoming the 20th vice president under James Garfield. While Garfield was mortally wounded by Charles Guiteau on July 2, 1881, he did not die until September 19, at which time Arthur was sworn in as president, serving until March 4, 1885. Before entering national politics, Arthur had been Collector of Customs for the Port of New York. He was appointed by Ulysses S. Grant but was fired by Rutherford B. Hayes under false suspicion of bribery and corruption. A political protégé of Roscoe Conkling, his notable achievements in office as President included civil service reform and the passage of the Pendleton Civil Service Reform Act. The passage of this legislation earned Arthur the moniker "The Father of Civil Service." Arthur was born in the town of Fairfield in Franklin County, Vermont, on October 5, 1829, although he sometimes claimed to be born in 1830 (even his grave inscription says the latter). His parents were William Arthur and Malvina Stone. Political rivals long circulated the rumor that he had been born across the International Boundary in Canada in hopes of creating doubts as to his eligibility for the presidency (under Article II of the U.S. Constitution the president must be a natural-born citizen). The rumor is accepted as untrue. Arthur attended public schools and later attended Union College in Schenectady, New York. There he became a member of Psi Upsilon, North America's fifth oldest college fraternity, and graduated in 1848. Arthur became principal of North Pownal Academy in North Pownal, Vermont, in 1851; later he studied law and was admitted to the bar in 1854. Arthur commenced practice in New York City, where he supported equal rights for blacks who objected to the racial segregation of city transportation. He also took an active part in the reorganization of the state militia. Arthur married Ellen "Nell" Lewis Herndon on October 25, 1859. She was the only child of Elizabeth Hansbrough and Captain William Lewis Herndon USN. She was a favorite niece of Commander Matthew Fontaine Maury, USN of the United States Naval Observatory where her father had worked. In 1860, Chester Arthur and "Nell" had a son, William Lewis Herndon Arthur, who was named after Ellen's father. This son died at age two of a brain disease. Another son, Chester Alan Arthur II, was born in 1864, and a girl, named Ellen Hansbrough Herndon after her mother, in 1871. Ellen "Nell" Arthur died of pneumonia on January 12, 1880, at the age of 42, only twenty months before Arthur became President. While in the White House, Arthur would not give anyone the place that would have been his wife's. He asked his sister Mary, the wife of John E. McElroy, to assume certain social duties and help care for his daughter. President Arthur also had a memorial to his beloved "Nell"—a stained glass window was installed in St. John's Episcopal Church within view of his office and had the church light it at night so he could look at it. The memorial remains to this day. During the American Civil War, Arthur served as acting quartermaster general of the state in 1861 and was widely praised for his service. He was later commissioned as inspector general, and appointed quartermaster general with the rank of brigadier general and served until 1862. After the war, he resumed the practice of law in New York City. With the help of Arthur's patron and political boss Roscoe Conkling, Arthur was appointed by President Ulysses Grant as Collector of the Port of New York from 1871 to 1878. This was an extremely lucrative and powerful position at the time, and several of Arthur's predecessors had run afoul of the law while serving as collector. Honorable in his personal life and his public career, Arthur nevertheless was a firm believer in the spoils system even as it was coming under vehement attack from reformers. He insisted upon honest administration of the Customs House but staffed it with more employees than it really needed, retaining some for their loyalty as party workers rather than for their skill as public servants. In 1878, Grant's successor, Rutherford Hayes attempted to reform the Customs House. He ousted Arthur, who resumed the practice of law in New York City. Conkling and his followers tried to win back power by the renomination of Grant for a third term at the 1880 Republican National Convention, but it was not to be. Grant and James G. Blaine deadlocked, and after 36 ballots, the convention turned to dark horse James A. Garfield, a long time Congressman and General in the Civil War. Conkling and his Stalwart supporters reluctantly accepted the nomination of Arthur as vice president. Arthur worked hard raising money for his and Garfield's election, but it was still a close thing, with the Garfield-Arthur ticket recieving a nationwide plurality of less than ten thousand votes. After the election, Conkling began making demands of Garfield as to appointments, and the Vice President-elect supported his longtime patron against his new boss. According to Ira Rukow's recent biography of Garfield, the new President quickly grew to hate Arthur, and wouldn't even let him into the White House. The Vice President was in a major bind. He knew that there were a great number of people in the country who thought that he had something to do with the attempted murder of the President, and didn't want anything to do with succession until it was actually necessary, so for two months and 19 days, the country drifted, leaderless. On September 19, the President died. Through no fault of his own, the dandified pol who was the poster boy of corruption, was President of the United States. President Arthur took the oath of office twice. The first time was just past midnight at his posh Lexington Avenue townhouse on September 20th, the second time was upon his return to Washington two days later. Avoiding old political cronies, Arthur determined to go his own way once in the White House. He became a man of fashion in his garb and associates and was often seen with the elite of Washington, D.C., New York, and Newport. To the indignation of the Stalwart Republicans, the onetime Collector of the Port of New York became, as President, a champion of civil service reform. Public pressure, heightened by the assassination of Garfield, forced an unwieldy Congress to heed the President. In 1883, Congress passed the Pendleton Act, which established a bipartisan Civil Service Commission, forbade levying political assessments against officeholders, and provided for a "classified system" that made certain government positions obtainable only through competitive written examinations. The system protected employees against removal for political reasons. Acting independently of party dogma, Arthur also tried to lower tariff rates so the government would not be embarrassed by annual surpluses of revenue. Congress raised about as many rates as it trimmed, but Arthur signed the Tariff Act of 1883 anyway. Aggrieved Westerners and Southerners looked to the Democratic Party for redress, and the tariff began to emerge as a major political issue between the two parties. The Arthur Administration enacted the first general Federal immigration law. Arthur approved a measure in 1882 excluding paupers, criminals, and the mentally ill. Congress also suspended Chinese immigration for ten years, later making the restriction permanent. In 1884, the International Meridian Conference was held in Washington at President Arthur's behest. This established the Greenwich Meridian which is still in use today. President Arthur demonstrated that he was above factions within the Republican Party, if indeed not above the party itself. Perhaps, in part, his reason was the well-kept secret he had known since a year after he succeeded to the Presidency, that he was suffering from Bright's Disease, a fatal kidney disease. Arthur ran in the Republican Presidential Primary in 1884 but lost the party's nomination to former Speaker of the House, James G. Blaine of Maine. Publisher Alexander K. McClure wrote, "No man ever entered the Presidency so profoundly and widely distrusted, and no one ever retired… more generally respected." Author Mark Twain, deeply cynical of politicians, conceded, "It would be hard indeed to better President Arthur's administration." Arthur is remembered as one of the most society-conscious presidents, earning the nickname "the Gentleman Boss" for his style of dress and courtly manner. Upon taking office, Arthur did not move into the White House immediately. He insisted upon its redecoration and had 24 wagonloads of furniture, some including pieces dating back to John Adams' term, carted away and sold at public auction, and Arthur commissioned Louis Comfort Tiffany to replace them with new pieces. A famous designer now best-known for his stained glass, Tiffany was among the foremost designers of the day. Arthur was a fisherman who belonged to the Restigouche Salmon Club and once reportedly caught an 80-pound bass off the coast of Rhode Island. Widely popular by the end of his presidency, four young women (ignorant of Arthur's pronouncement that he would never marry again) proposed to him on the day he left office. He was sometimes called "Elegant Arthur" for his commitment to fashionable attire and was said to have "looked like a president." He reportedly kept 80 pairs of pants in his wardrobe and changed pants several times a day. He was called "Chet" by family and friends, and by his middle name, with the stress on the second syllable ("Al-AN"). Arthur served as President through March 4, 1885. Upon leaving office, he returned to New York City where he died of a massive cerebral hemorrhage at 5:10 a.m. on Thursday November 18, 1886, at the age of 57. Arthur suffered from Bright's disease, and his death was most likely related to a history of hypertension. His post presidency was the second shortest, longer only than that of James Polk (excluding presidents who died in office). Chester was buried next to Ellen in the Arthur family plot in the Albany Rural Cemetery in Menands, New York, in a large sarcophagus on a large corner plot that contains the graves of many of his family members and ancestors. ^ Mitchell, Sarah E. "Louis Comfort Tiffany's work on the White House." 2003.